Completed in Spring 2007, Roses is a mixed-media, 9-panel montage dedicated to the woman with gynecologic cancer by artist Tuck Contreras. Here in the U.S., the rose has become the ultimate way to say “I love you,” largely because of the culture that’s grown up around Valentine’s Day, when over 150 million roses are sold nationwide. But for centuries, cultures around the world have endowed the rose with a different set of meanings. For many, the rose is a traditional symbol of wisdom, divinity, transformation, beauty, remembrance, celebration, strength, and hope. It holds special meaning for everyone from mystics (Brahman, Persian, and Christian) to activists within the U.S. labor movement, having inspired the 1912 “Bread and Roses strike” of Lawrence, Massachusetts textile workers, for whom the rose represented the aspirations of laboring women, everywhere, seeking fair compensation and dignified work conditions. 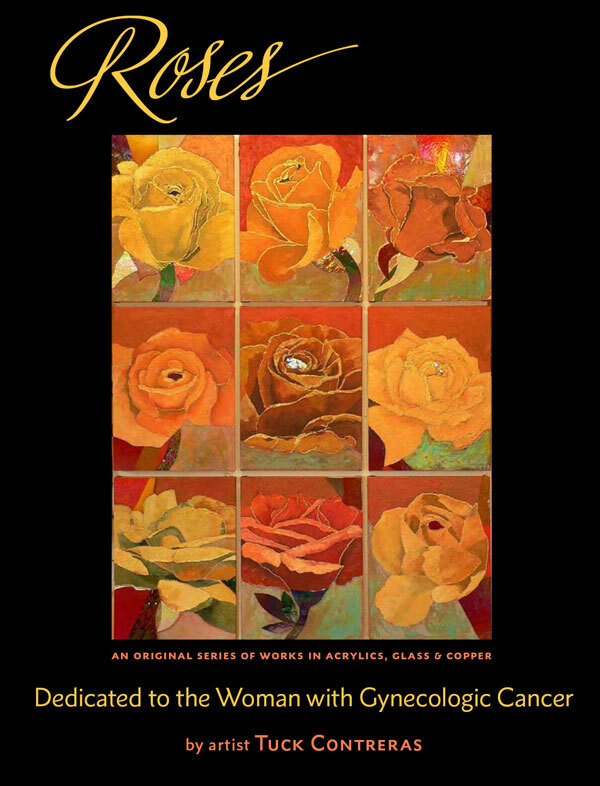 With her Roses series, artist Tuck Contreras reimagines the classic floral yet again, mixing acrylics, copper, art glass, metallic pen, and metallic powder in order to capture the light-emitting qualities of the rose in a natural setting, colored with a sun-washed palette. The result is an artwork where symbolism and vibrant color, formed in the infinite play of light and shadow, engage the passions and hopeful spirit of the cancer patients to whom Tuck has dedicated this vision. I am one, myself … which is where our story begins…. I am a survivor of Grade 3, Stage IIB endometrial cancer. I also run a communications research & design consultancy, so I suppose it was inevitable that I would turn my attention to the sorry state of medical communications for cancer patients once I became one. Tuck is a close friend of many years, and a talented artist to whom I turned for help with the project we now call Roses. At the time, I planned to develop a series of physician podcasts for dissemination over the Web (plus supplementary printed material, including something I call “medical information décor”), and I asked Tuck to contribute “something beautiful” that I could use to visually integrate high-tech with a human touch. could have an intense and sustained emotional dialogue. … An image that would also serve to remove some of the cultural stigmas and shame around gynecologic cancers. … An image that would create an opening for women to think in new and different ways about their bodies and disease. I wanted art that would become more than just decoration for hospital walls. I wanted to make art an integral part of our medical communications, so that these would inform + inspire us. The cancer experience is trying and difficult for all of us who go through it, and even the most inspired medical communications can not change this fact. But they can ease the burdens of medical decision-making by providing transformative opportunities for cooperation, creativity, and innovation across human borders (professional, social, cultural, and geographic). This alone won’t vanquish our cancers, but it will give us an outlet for action, along with what some have called the “priceless gifts” of hope, education, and self-reliance. And that will just have to do … for now. Our Roses project, which has expanded beyond my original vision to include a line of Roses merchandise, will support our effort to develop innovative medical communications for women with gynecologic cancers, with the aim of furthering a democratic politics of knowledge & expertise. This places us somewhere on the cusp of Web 2.0 (the “participatory Internet” of interactivity and social networking, promoting what new media critic Andrew Keen decries as “the cult of the amateur”) … all the while intent on moving towards Web 3.0, which promises to make room for professional expertise in a democratized Internet. The folks at BigThink have tried this using a traditional interview model. BigThink’s interviews with experts are documented on video (“watch the interviews we conducted with more than 600 experts, from hedge-fund managers to neuroscientists”), with space for viewer comments & discussion provided below. Our model is different. Our aim is to have oncologists and cancer patients collaborate on their own “knowledge” database, with online dialogue grounded in the real world of clinical practice at the Gynecologic Oncology Unit of UCSD Medical Center’s Moores Cancer Center. This is where I was treated, receiving top-notch specialty care from world-class clinicians at a leading university and research center. UC San Diego physicians’ talent and know-how is extensive, and their medical credentials, impeccable. Our project gives these fine professionals a chance to explore alternative uses of new media for medical education, which I hope will expand to include resources for traditionally underserved communities around the world. We will begin by creating the kind of high-quality, evidence-based medical information needed to identify and promote “best practices” within the field of gynecologic oncology. In keeping with our commitment to helping rebuild the intellectual commons for a digital age, this information will be broadly available to anyone, anywhere, with access to the Web. I have a guiding vision, and some pretty good ideas of where to start (e.g., building a tiered podcast library, as explained below under the heading “Physician Podcasts”). But I am determined not to box us in too early in the process. One way we ensure that expert and lay voices can trust and learn from each other is to be accountable and responsive to one another from the beginning. This will require room to engage and maneuver, a willingness to change course and adapt to changing circumstance, and the freedom to set our own priorities and work flow. This means that I’m not going to set arbitrary deadlines for us, or promise scheduled deliverables. Those of us who launched and are committed to this project all have other jobs, and lots of competing demands on our time. We will do what we can, as we can, which will no doubt disappoint some, but will keep us sane and involved for the long term. What I can promise is transparency. I will update this website’s What’s Blooming news page to let you know what’s going on behind the scenes, to interact with and solicit feedback from the Roses community, and to celebrate those occasions when we are inspired by this dialogue to create ever more resources that inform + inspire. At the core of our Roses project will be an ever-expanding library of easy-to-update physician podcasts: a series of audio recordings on all things having to do with gynecologic cancers and their treatments. These audio files will be posted to the Web, and we’ll be able to download them from there to our technology of choice (computer, portable media player, PDA, smartphone, mobile phone, e-book reader, even video game consoles such as the Xbox and Wii) and listen to them whenever, wherever, and however we please. The podcasts are designed for cancer patients, their networks of friends & family, plus other caregivers, health care professionals, and stakeholders with an interest in gynecologic cancers. As such, they assume an intense interest in the subject, and are not geared to a dilettante audience. While the podcasts will allow each of us to engage in leisurely conversations with top-tier clinicians and researchers specializing in gynecologic cancers, these digital conversations are not designed to be entertaining. Our emphasis is on content, not packaging. As such, the podcasts will be audio, not video, so that busy physicians can easily produce (and update) content on the fly, without needing anything more at hand than a dictating machine, already a familiar technology in most physicians’ offices. The other benefits of audio over video are that it is more accessible on a range of delivery platforms; it takes less bandwidth to transmit, thus making it cheaper to download if your carrier charges for this sort of thing (and if they don’t now, they may well in the future); and, you can listen while multitasking (e.g., while exercising ;-) and attending visually to other things. Nor will we be dumbing down the content. We take the position that, given the opportunity for self-directed, self-paced learning, each of us can learn enough to converse comfortably with medical professionals. To this end, we will offer different tiers of medical information — ranging from a library of FAQs and other introductory material to intense academic-level discussions of gynecologic cancers and related research — so that patients (as well as other health care professionals) are privy to as much detail and debate over the latest advances and therapies as they want. I’m hoping in this way to address the problem of what Nobel prize-winning economist Joseph Stiglitz calls “asymmetric information” (where one party in an economic transaction knows more than the other, thus giving her an unfair advantage). While none of us can be an expert in everything, including the medical conditions with which we must contend, it is possible to learn enough so that we can collaborate effectively with those who are medical professionals, understand and appreciate the expertise they bring to the table, and make our own educated assessments of (often exaggerated or misleading) medical claims and statistics, recommended therapies, and so-called “best” clinical practices. In keeping with these educational goals, the physicians won’t avoid jargon or difficult concepts that most patients with gynecologic cancer are going to encounter at some point during their care & treatment. But we will structure the podcasts so that each of us can learn at our own speed, in stages. I’m already planning various helps for this, like a live glossary where patients create, add to, and discuss definitions of medical terms; also, the inclusion of expert and non-expert folksonomies, where health care professionals and patients can “tag” podcast content with terms that are meaningful to each group; and increasing opportunities for community dialogue. There may be times when even the most motivated patient finds a podcast boring, or overwhelming, or both. This is normal, and not just the inevitable outcome of a plain-vanilla presentation. It’s part of the learning process, and happens to all of us when we encounter unfamiliar subjects and arguments and jargon. In such instances, it may help to listen to and discuss the podcasts with others in your circle of family & friends with whom you feel comfortable thinking aloud about uncomfortable — even scary and threatening — topics. Sometimes it’s easier to have this kind of intimate conversation with strangers who are going through the exact same thing you are, and so we want to set up various online spaces for this kind of dialogue, too. It is unfortunate that Internet technologies are still biased towards the literate person of means. There are limits to how much we can correct for this bias, but I promise to do what I can, and welcome suggestions that people may have as to how we can achieve more on this front. Our physician podcasts are designed to serve what’s known to scholars as an “audiate” audience. You don’t have to be literate to listen and learn. And you don’t need a computer to access audio podcasts, either. Mobile devices, including phones, can download and play a podcast. We are striving to be as inclusive as we can. Because patient input will ultimately determine the quality and success of our physician podcast project, it’s especially important that we don’t discriminate against — exclude from the discussion or the Roses community — the practical wisdom and experiences of those who are illiterate. Today, American universities face exceptional opportunities and exceptional risks. Their research is needed more than ever now that new discoveries and expert knowledge have become so essential to progress in health care, economic growth, and other endeavors that matter to the nation. As careers grow more complicated and subject to sudden change, adults in all occupations and stages of life are seeking further education at the very moment when technology gives people everywhere ready access to university instruction. Now that scientific discovery and continuing education are valued so highly, pressures have arisen from every quarter to have universities make their services available to those who need them…. Our Roses collective shares this vision of the unique social role of medical schools and teaching hospitals as not-for-profit academic institutions that are entrusted with essential public responsibilities. In keeping with this spirit of public service, our Roses website will occasionally feature a series of themed physician podcasts, intended to keep the non-specialist community up-to-date on the latest advances in science & technology & patient care, relating to gynecologic cancers. There is considerable evidence that patients treated by doctors who specialize in a single disease and its treatment do better. The saying “practice makes perfect” makes intuitive sense when applied to medical diagnosis and treatment, especially given the speed of new developments in the treatment of many life-threatening conditions. Hospitals affiliated with medical schools are more likely to have specialists on staff who focus only on your condition and who are in touch with research scientists all over the world who are studying it. You may not ultimately choose to be treated by these doctors, but they may be willing to consult with your own physician by telephone about your care in the future. This is particularly important for those who have rare conditions or who do not live close to a medical center. There is considerable evidence that patients treated by doctors who have conducted a surgical procedure many times or who have treated a relatively rare condition frequently do better than those who are seen by physicians with less experience. Medical treatment relies heavily on a physician’s clinical judgment about how to apply new medical advances, and a doctor who has treated many patients with your condition will draw on that experience when working with you to determine your treatment plan. It is my hope that our Roses-featured podcasts will improve public access to specialists at academic medical centers, so that more of us may benefit from their hard-won expertise and experience. Our first featured series of physician podcasts (supplemented by printable transcripts and visual aids) will focus on surgical treatment options for gynecologic cancers. Lead faculty at the UC San Diego Medical Center will take an unflinching look at the factual claims and rational arguments for new (e.g., laparoscopic, robotic) as well as traditional surgeries, and provide us with detailed assessments of clinical risks & benefits for the panoply of surgical interventions currently available. This will be followed by a second featured series of podcasts on the politically-charged subject of differences-based advances in treating gynecologic cancers. UC San Diego Medical Center faculty are leaders in this relatively new field of study that takes categories of human difference (race, ethnicity, class, gender, geographic location, sexual identity) as basic units of analysis in medical research and medical treatment. Their growing knowledge of how we personalize cancer treatment for medically-distinct bodily subtypes holds great promise for us all. Not only does this have the potential to help reduce health disparities in the United States, but it may also lead to needed breakthroughs in cancer research, by making that research more inclusive. That’s as far ahead in our lecture series as I’m able to plan for now, but you can follow our progress in developing these first two Roses features on our What’s Blooming news page, where I promise to post periodic updates. It’s not fashionable to use Web 2.0 new media at a slow and thoughtful pace. But that is my intent. Our Roses project is designed to run on scholarly time: festina lente, an oxymoron dating from the Graeco-Roman period, and for centuries, applied to most areas of public life requiring prudent judgment & decision-making — everything from the recommended leadership style for Roman emperors and Britain’s Queen Elizabeth I, to the business models favored by tradesmen during the Renaissance era. My own knowledge of festina lente practices and symbolism is limited to early-modern European history, but I expect the concept turns up in one form or another in most human cultures around the globe. As academics, those of us responsible for Roses know that the creation of high-quality health care information (able to withstand the rigors of peer-reviewed publication in prestigious medical journals) takes time, along with a great deal of high-level research, planning and intellectual energy. As patients and physicians who participate in the U.S. health care system, we also know that there is little time for such luxuries during a normal clinical day. The 15-minute office visit, and the radiologist who must process 3 images per second from CT/MRI scans (with pressure on the busiest emergency room radiologists to “read” up to 150,000 images per day), are now the rule, not the exception. Moreover, the relentless time pressures take a real toll on patients, who often find it difficult to “Talk to your doctor …” about anything important at all, with an imagined clock ticking in the background. For many of us, it takes more than 15 minutes just to ease into a conversation about a subject fraught with anxiety, so the scheduler’s expectation that we can casually flip back-and-forth between living it & talking about (reflecting on) it, during the course of a brief office visit, while being poked and prodded in varying states of undress, is unrealistic. I believe that new Web-based communications technologies offer us a way out of this dilemma. Making strategic use of physician podcasts is just one means by which we can ease the time pressures on oncologists and cancer patients, and provide us all with an opportunity for self-directed learning & teaching. It is our hope that profits from the sale of Roses merchandise — as well as the community that gathers around our Roses project — will help us create a sustainable space for vigorous deliberation where experts, and those interested in what they have to say, can think deeply and honestly about the medical issues & options, risks & trade-offs, faced by those of us with gynecologic cancer. So, with the launch of this Web page in January 2011, let the deliberation begin. There are several ways you can contribute to our Roses-sponsored physician podcast project…. Usability guru Steve Krug (author of Don’t Make Me Think!) distinguishes neatly between FAQs (lists of “Frequently Asked Questions”) and what he calls QWWPWA (lists of “Questions We Wish People Would Ask”), usually marketing pitches masquerading as FAQs. Gynecologic oncologists at public universities are not companies deviously trying to sell you something, or marketers trying to head you away from asking questions they’d rather not answer. But all of us who create online content, no matter how noble our motives, fall prey at one time or another to the QWWPWA syndrome (as do most of us in real life, too; e.g., whenever we hope someone will ask us to talk about whatever it is we want to discuss, and when they don’t, we go ahead and talk about it anyway ;-). As Krug knows, FAQs are “enormously valuable” when done right, and we do aim to get our medical FAQs right. To ensure that we avoid some of the traps of online self-expression — beaming irrelevant monologues into digital space, as any academic worth her salt is more than happy to do ;-) — we have planned a series of physician podcasts that will provide leisurely, detailed explanations and answers to the questions that real cancer patients DO ask. If you are a woman with a gynecologic cancer, we would like to tap your practical wisdom. In particular, if you have experienced information gaps during the course of treatment, let us know and we’ll see if we can fill them. This is your chance to ask some of those questions about gynecologic cancers which you promptly forget as soon as you put on a hospital gown in the doctor’s office … or that don’t occur to you until several days after your latest visit and exam … or that keep you awake with worry at 3:00 in the morning … or are just too embarrassing…. It would also be helpful to learn what — if anything — you wish you’d been told at the beginning of the process, especially during that difficult in-between period after you’ve received your cancer diagnosis, but before you’ve had your first meeting with a gynecologic oncologist (or whoever is treating your cancer). This is the sort of information gap that podcasts can address really well. Our goal is to develop a lot of podcast content in dialogue with the real-world testimony of people who have had and are having the cancer experience. But we also need to let the physicians do a little QWWPWA, too. UC San Diego Medical Center physicians are also first-rate educators, and there are times when they know better than we do what needs to be learned; on those occasions, we need to just sit back & listen to them talk about whatever they want to. I would like eventually to set up wikis to serve as a gathering place for those willing to work on translations of our physician podcasts. If you know a language other than English, and have an interest in developing materials on gynecologic cancers for non-English speakers, let us know. If you prefer to lend a financial helping hand, please think about donating to Roses. All contributions are welcome, no matter how modest. Even a few dollars will help us maintain and add to our online services. Plus, each contribution you make to Roses can be designated a Tribute Gift — which offers you a unique way of paying public tribute to someone special in your life. So there are multiple ways in which a monetary gift to Roses will return lasting value to you and others. By wearing, using, displaying, and giving Roses-brand swag (Stuff We All Get), you help spread the word about our innovative project. Honor a loved one with gynecologic cancer and join the community of cancer patients, survivors and supporters who actively promote accessible medical information for all by purchasing Roses merchandise and original art works, for yourself and for others. Not only do you and others get the opportunity to enjoy Tuck’s glorious art in an everyday setting … you also are helping cancer patients and those who care for them develop their own tools for understanding, managing, struggling and living with the disease. It is with regret — and some surprise — that I announce the end of this website’s participation in the Powell’s Books, Inc. Partner Program. As of 29 August 2012, we will no longer earn a percentage on books purchased through our links to Powells.com (or Amazon.com). Hence, I have decided to drop all such links. There’s no point in pushing one particular out-of-state retailer over another when local, independent bookstores everywhere need our support. Click/tap here to learn more. (this website, our Roses-sponsored physician podcasts & podcast features, etc.). Roses-related material at Tuck’s website. Our local search tool is powered by Open Source Software: KSearch. Copyright © 2011–2019 Communicating By Design intellectual property. Substantive Revision: 4 August 2018. This Web page was last modified on: 01/05/2019 9:55 PM. Keen, Andrew. The Cult of the Amateur: How Blogs, MySpace, YouTube, and the Rest of Today’s User-Generated Media Are Destroying Our Economy, Our Culture, and Our Values. 2007; rpt. New York: Doubleday, 2008. Bok, Derek. Beyond the Ivory Tower: Social Responsibilities of the Modern University. Cambridge, MA: Harvard University Press, 1982. Bok, Derek. Universities in the Marketplace: the Commercialization of Higher Education. Princeton, N.J.: Princeton University Press, 2003. Gruman, Jessie. AfterShock: What to Do When the Doctor Gives You—or Someone You Love—a Devastating Diagnosis. 2007; rpt. New York: Walker & Company, 2010. Krug, Steve. Don’t Make Me Think! A Common Sense Approach to Web Usability, Second Edition. Berkeley, CA: New Riders, 2005.